North Bend firefighters watch as water fills the ditch on the south side of Highway 30 west of Cottonwood Street. Once the ditch overflowed, the water crossed the highway into the streets of North Bend and filled the town in less that two hours. Last Tuesday, March 12, there was still several inches of snow on the ground. Then about 70 hundreths of rain fell in a 24 hour span. By Wednesday, fire department personnel were keeping a close eye on the Platte River, afraid of an ice jam causing a flood. 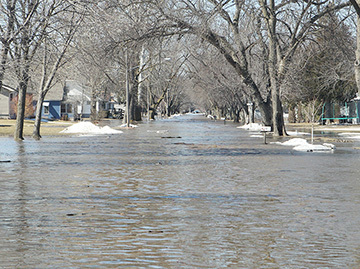 Water fills Ninth Street, looking west from Oak Street, on the east end of North Bend around 12:30 p.m. Friday, March 15. While a sandbagging effort was in full swing in North Bend Wednesday, smaller waterways to the north began to flood, including the Maple Creek eight miles north of North Bend. The north end of Main Street by the old popcorn plant was briefly closed as water pooled there. By Thursday, the flooding to the north had subsided. The Maple was in its banks with the water level down to about half capacity. Perhaps all the precaution and sandbags was for naught? Thursday night, around 9 p.m. events were set in motion that would change any feeling of good fortune in North Bend. The Flood of 2019 sprang not from a river, but a ditch. The North Bend cutoff ditch runs about three and a half miles west of town. Part of its levee near McGinn’s Lake failed. On the west side of the cutoff ditch, McGinn’s Lake, which has no dike to speak of, was soon flooded. One cabin fell completely into the river. 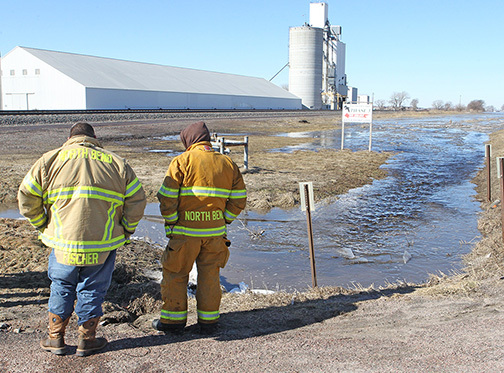 Water began to flow east along the south side of the railroad tracks, filling fields and eventually the North Bend Golf Course and Fifth Street as it went. At some point west of North Bend, the path of the water narrowed, raising the pressure high enough to blow out the railroad tracks. Water was now creeping into the ditch north of the tracks along Highway 30, inching its way toward North Bend. Water cascades over Highway 79 just north of North Bend Friday afternoon, March 15. The highway was closed from Friday until Sunday night. Cottonwood Street crosses Highway 30 to go south to the golf course and Pioneer Lake, offering a natural obstacle for the approaching water. When the water arrived at Cottonwood Street at 10:57 a.m. Friday, NBFD firefighters were there to greet it. They sandbagged the culvert under Cottonwood street hoping to stop its march east, but a new surge of water quickly filled the ditch. The water spilled over Highway 30 where it gained access to North Bend proper. At that time a voluntary evacuation was called for North Bend. Streets filled with water from that southwest corner of town, spreading east and north one block at a time. At 11:45 a.m., the first water spilled onto Main Street from Seventh Street. By 1:30 essentially every street in town was flooded. 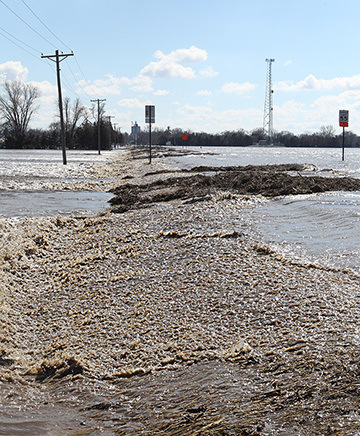 The Flood of 2019 was in full effect as the breach in the cutoff ditch levee grew to a failure 300 to 400 feet wide.